Day 03: Kathmandu (1300m) to Pokhara (900m) by bus, 6 hrs or by fly, 30 min. We start our day early in the morning to catch a tourist bus at 7 am, we then set off for Pokhara via Nepalese country side that offer green hills, river, farms etc. After a 200 km and around 6 hours drive we reach Pokhara (a city of Lake, literally); or 30 min. fly to Pokhara as per departure time. A city that offers us the magnificent view of various mountains namely Dhaulagiri, Manaslu, Machhapuchre and other mountain of Annapurna range. Do some last minute shopping and self exploration around the town (walk around few lake, boating etc) (Overnight at deluxe hotel on BB basis). Day 04: Fly to Jomsom (2720m), then trek to Kagbeni (2800m), 3-4 hrs. 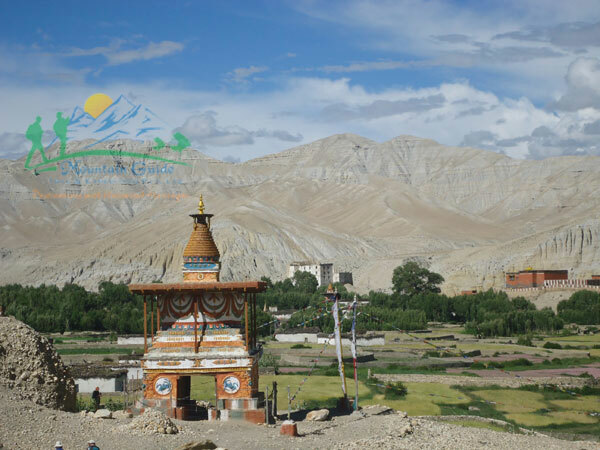 You will be land on district headquarters of Mustang and will start trek to Kagbeni, the starting point of the Upper Mustang, where you can make your eyes busy for The spectacular views of Nilgiri, Dhaulagiri, Tukuche peak and Dhampus. 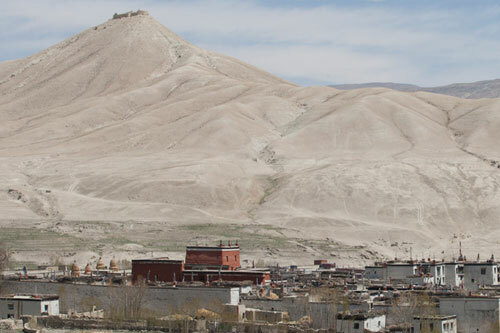 Kagbeni is the most interesting typical Tibetan village and the entry point of the upper Mustang for overnight stop. (Overnight at tea house on full board basis). Day 05: Trek from Kagbeni to Chele (3100m) 6-7 hrs. The trail leads up toward the east bank of the Kaligandaki that climbs over many ridges as it heads north and reaches Tangbe Village. The town is labyrinth of narrow alleys amongst white washed house, fields of buckwheat, barley, wheat and apple orchards. The Nilgiri peaks,which dominates the southern skyline of Kagbenic continues to loom massively at the foot of the valley. Beyond Tangbe we reach Chhusang Village and crosses the river, continue climbing north up the trail to a huge red chunk of conglomerate that has fallen from the cliff above forming a tunnel through which the Kaligandaki follows. The trek now leaves the Kaligandaki valley and climb steeply up a rocky gully to Chele at 3030m. (Overnight at tea house on full board basis). Day 06: Trek from Chele to Gheling (3570m), 7-8 hrs. The climb continues along step, treeless, waterless terrain, along the side of the spectacular steep canyon to pass and cairn of rock at 3540m. Then the trail makes a long gradual descent to some Chortens on a ridge, and then the trail descends further on a pleasant trail to Samar. The Annapurna, still dominated by Nilgiri, is visible far to the south. Climb above Samar to a ridge, then descend into a large gorge and the trail goes into another valley field, crosses a stream and climbs up to a ridge at 3800m. The route climbs sharply up and down over a series of high passes, before the final descend to Geiling. (Overnight at tea house on full board basis). Day 07: Trek from Geling to Tsarang (3560m ), 6-7 hrs. From Geling, the trail climbs gently to the interesting pass on our trek NYILA and descends below the blue, gray and red cliffs. After crossing a steel bridge of the Tangmar Chu (river), we will arrive to a MANI (Prayer WALL) perhaps the longest and most spectacular stretch and main wall in Nepal. Climbing over another pass at 3600m the route makes a long gentle descent to Charang. The huge five €“ story white Dzong and red Gompa is an interesting visit to observe collections of statues and Thankas as well as many large paintings of seated Buddha's. (Overnight at tea house on full board basis). Day 08: Trek from Tsarang to Lo Manthang (3840m ), 5-6 hrs. The trail descends about 100 meters down from Charang, crosses the Charang - Chu and climbs steeply up a rocky trail to a cairn on a ridge and continues to climb. Finally, from a ridge at 3850m there is a view of the walled city of LO. 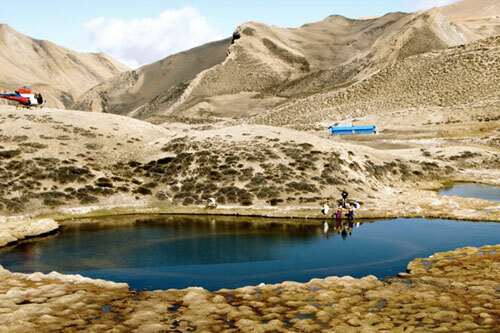 After a short descent, cross a stream then climb up into the plateau of Lo- Manthang. (Overnight at tea house on full board basis). Day 09: Lo-Manthang , day hiking exploring around. Another day in Lo - Manthang gives you the chance to explore its many sights; the Tall Champa Lakhang (God house,) the red Thugchen Gompa, Chyodi Gompa and the Raja's Palace; as well as to gaze at the surrounding panoramic views of the Tibetan Plateau and the Himalaya. Besides Lo-Manthangthere is two other interesting valleys worth visiting. The western valley Tingkhar, the sight of Raja's summer palace, Kimling and Phuwa as well as the Gompa of Namgyal (The Monastery of Victory) is the newest and most active Gompa in Lo. In the eastern valley lies the village of Chosar, also rich in Gompas and the valley is the main trading route to Lhasa. (Overnight at tea house on full board basis). Day 10: Lo-Manthang- Dhakmar (3520m) 8-9 hrs via Ghar Gompa. This is an opportunity to visit two other villages on your return trek. The trail climbs steadily to the pass marked by a cairn, offering a last glimpse of Lo-Manthang. We cross highest pass this trek and arrive in Ghar Gompa (3920 Meters). This monastery is very old and older than Samye monastery in Tibet, supposed to be built around 730AD. After crossing the pass around 4100meters than we descend down to the way in Dhakmar (3520m) where we fix our camp site for stay overnight. (Overnight at tea house on full board basis). Day 11: Trek descend from Dhakmar to Samar (3540m), 6-7 hrs. From Dhakmar the way goes down to until Ghami (3460m) the huge greenery village in Mustang where we can see the ancient monastery and Stupas with. You can see the local houses here like cave. Than after the trail goes ascend until Nyi La pass and descend to Samar through the same route. (Overnight at tea house on full board basis). Day 12: Trek from Samar to Kagbeni (2800m), 5-6 hrs. Today, all the way downhill to Chhusang with panoramic red stone cliffs. 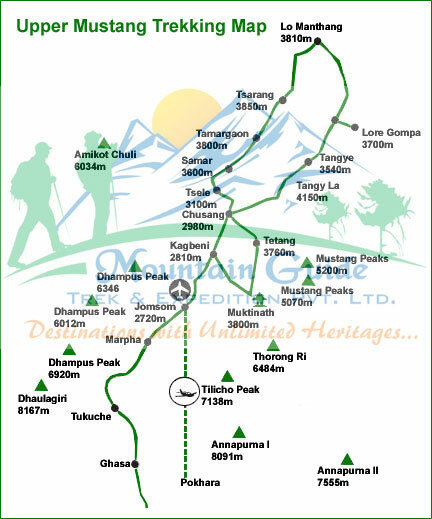 After Chhusang we will climb little more than arrive in Tangbe village and finally we will be in Kagbeni. (Overnight at tea house on full board basis). Day 13: Trek from Kagbeni to Jomsom (2720m), 4-5 hrs. 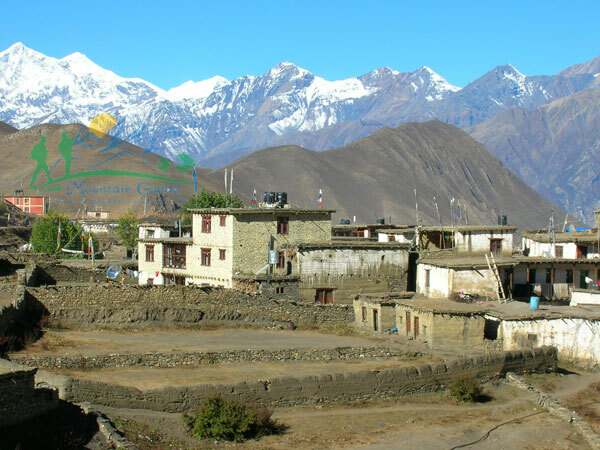 We trek to Jomsom with the valley of Kaligandaki River which is also known as windy valley where every day big wind blowing and overnight in Jomsom. 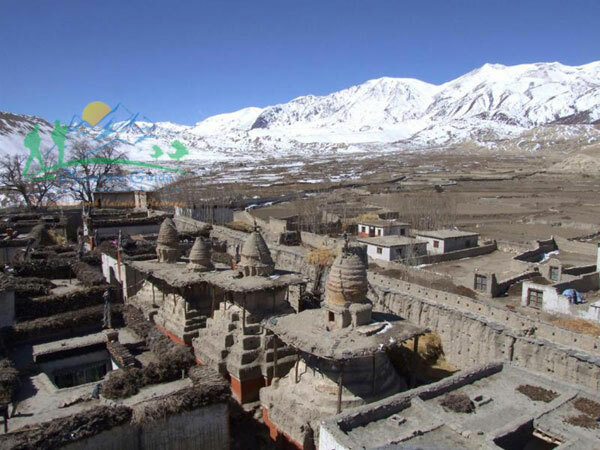 You will explore in Jomsom village. (Overnight at tea house on full board basis). Day 14: Fly Jomsom to Pokhara (960m), 20 min. Early morning we fly to Pokhara with thrilling fantastic Mountain View including Dhaulagiri, Nilgiri, Annapurna south, Annapurna I and Machhapuchre during the flight. In the day Time if we have time we will meet the places are in Pokhara such as International Mountain Museum, Devis falls, and Boating in Fewa Lake. (Overnight at deluxe hotel on BB basis). Day 15: Pokhara to Kathmandu fly 25 min. /drive 6-7 hrs. In the morning we fly to Kathmandu, be sure to catch the left side of airplane for the best views of Himalayas. Or if by bus, we will arrange ticket in tourist coach at river side seat and start your journey at 7:30 am from Pokhara. Left site's seats of vehicles are nice to enjoy the scenery; the road follows by Trisuli River where you see many people rafting on the river. Around 2:00 pm you will arrive at Kathmandu (beside Thamel) and transfer to your hotel. The day at leisure to rest, perhaps catch up on some last minute shopping or explore any sights you missed during your first day in Kathmandu. Remember, we will be hosting a fantastic celebration "Farewell dinner" at traditional Nepalese restaurant with Mountain Guide Trek staffs for successful completion of the Upper Mustang Trek! (Overnight at deluxe hotel on BB basis). The following is a list of clothing and accessories that we recommend for Upper Mustang Trekking Nepal. This is not intended to be a comprehensive clothing and equipment list; rather it is intended to act as a reminder of those items that we are feel necessary for your comfort and convenience. However we recognize that you may have your own personal preferences for clothing which may be equally as suitable.